Nice and new 1st class 1-bedroom apartment on 26-28 Grecheskaya Street. Apartment is on the second floor of 5 storey building. Just after reconstruction, totally new furniture etc. 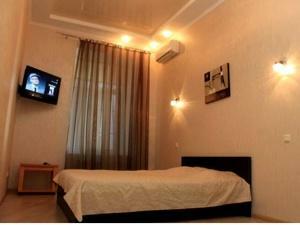 Very spacious bedrooms of 20 square meters with a Kings-ze bed, LCD TV and air-conditioner. Apartment is fitted with all necessary stuff for a comfortable stay in Odessa: autonomous heating system, good water pressure 2 LCD TV-sets, washing machine, 2 air-conditioners, iron, hairdryer, phone, High speed Internet Wi-Fi. Stunning and brand new apartment at 5a Gagarinskoye Plato (2ya Zhemchuzhina district). New 19-storey building with a beautiful park, children's playground and just 5 min walk to the sea! This 1-bedroom apartment located on the 18th floor that lets guests enjoy the panoramic sea-view from the windows. Upon entering apartment we get into a spacious entrance hall, on the right - bedroom with a dressing room, to the left - a spacious bathroom with a modern shower, and if we walk straight - we get into an open-concept living room with a fold-out sofa and a modern Kitchenette/Dining room. Kitchen has everything you need to cook your favorite meals. This apartment is fully equipped with 2 LED TV-sets with cable channels, washing maching, 2 air conditioners, oven, hairdryer, iron and board, kettle, dishwasher. Small and cozy 1-bedroom apartment after good reconstruction is situated at 14 Karetniy Lane, 15 min walk to Deribasovskaya street. First floor of 2-storey building. Entrance from the street, front door on code. Parking is available near the house at the secured parking lot. Small living room with a fold-out sofa, cozy dining table with chairs for 2 persons, mirror build in wardrobe. On the right side from the living room - bedroom with beautiful Queen-size bed, TV set with cable channels, air conditioner and a dresser. Small kitchen with a built-in furniture, plus microwave and electric kettle. Bathroom with a big angular bathtub, washstand, toilet and washing machine. This wonderful apartment is equipped with the following consumer electronics: TV set with cable channels, air conditioner, washing machine, microwave, electric kettle, iron, ironing table, Wi-Fi Internet. Autonomous heating system with good water supply round the clock. One bedroom cozy and small apartment with a perfect sea-view from windows. Situated on the 4th floor of 10 stored building with elevator at 1b Torgovaya Street. 10 minutes walk along Komsomolskiy and Primorskiy boulevards to the famous Potemkin Steps, Odessa Opera House and Deribasovskaya Street . Located very close to 2-bedroom apartment 3-027. There is 13 sq m living room with a fold out sofa and balcony with a view. In the 10 sq m bedroom you’ll find a Queen-size bed, armchair and TV set. Kitchen has all utilities for cooking. 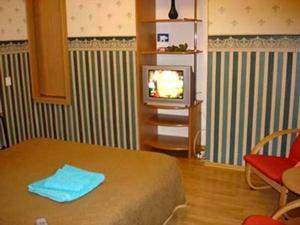 Apartment is fitted with: TV set with cable TV, microwave, washing machine, Air Conditioner. Something special on the famous Ekaterininskaya Square, 2 minutes walk from Primorskiy boulevard and no more than 10 min from Deribasovskaya. Entrance via quiet court yard, front door on code. 2nd floor of 3-storey building at 1 Ekaterininskaya Sqr. Very spacious 120 sq.m. 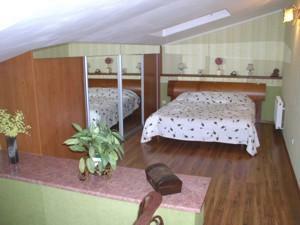 2-room Odessa apartment divided into 2 levels: sleeping area with a Queen-size bed and wardrobe on the second level. Living area with white leather coach, coffee table, home theater. 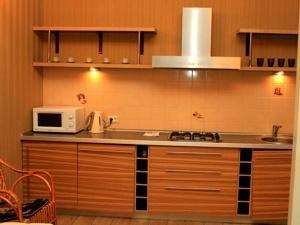 Cozy kitchen with all necessary built in furniture, dining table and chairs for four persons. Bathroom with a big Jacuzzi bathtub, washing basin, modern washing machine, toilet. Apartment is equipped with Plasma TV with cable channels, air conditioner, fridge, washing machine, iron and ironing board, electric kettle, hair dryer, high speed Internet Wi Fi. Maximum sleeps 4 persons! Parking is available at the court yard. Deluxe 2-bedroom Odessa apartment right in the heart of Odessa at 10 Deribasovskaya Str. 80 square meters, high 3.5m ceilings, clean yard entrance on code. Safe guarded parking. Windows and balcony face the famous Odessa Opera Theater! 2 King-size beds, 2 air-conditioners. 2 TV-sets with Satellite channels. Dinner table for 6. 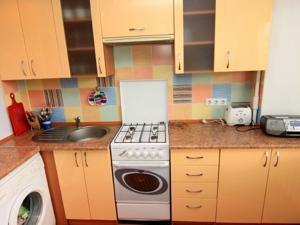 Kitchen with all amenities including toaster, microwave, electric kettle. Huge Bathroom with a bathtub, shower cabin and washing machine. Beautiful house located at the Fountan district - 3 Proreznaya Street, close to 10 St. of Fontan and Arcadia area. Garage for 2 cars, cozy courtyard, with a patio with table & chairs. On the first floor there is a living room, cabinet with a fold-out sofa and a piano, a bathroom with corner bathtub, kitchen and dining room. On the second floor there are two bedrooms with Queen-size beds, 2 children's bedrooms one with dbl bed and another one with 2 level beds which is ok for 2 children, second bathroom with a shower. This Odessa house has recently been renovated, all well made, good furniture, cozy and beautiful. All equipment for a comfortable living. 1st class NON SMOKING 1-room apartment at 24 Preobrazhenskaya Street. 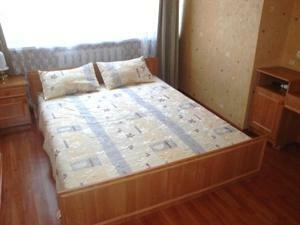 Nice & cozy studio apartment, 2 min walk from Deribasovskaya Str in a quiet courtyard. Gates to courtyard are on key, lighted entrance. Apartment is just after refurbishment. There is a spacious 28sq m room with a Queen-size bed and a fold out sofa, TV set with cable channels, small kitchenette with all the stuff for cooking, microwave, fridge, gas stove. Bathroom is of a small size, there is a toilet, small washing basin and stand shower. Apartment has central heating system, good water pressure, electric heater for hot water. This Odessa apartment is fitted with all needed consumer electronics such as TV set with cable channels, DVD, air conditioner, High speed Internet, microwave, fridge, hair dryer, iron, telephone. Local calls within Odessa are free of charge. Parking is available in the courtyard. Everything in the apartment is new and of a good quality. There is a room with a Queen-size bed, big 29’ TV set with satellite channels, small kitchenette with all the stuff for cooking, microwave, fridge, electric stove. Bathroom with a standard bathtub, stand shower and curtain, heated floor. Apartment has an autonomous heating system, good water pressure. This cozy apartment is fitted with all needed consumer electronics such as 29’ TV set with cable channels, DVD, air conditioner, High speed Internet Wi Fi, microwave, fridge, hair dryer, iron. You'll also find there such a things like bathrobes, umbrella, shoes kit. Local calls within Odessa are free of charge. Maximum sleeps 2 persons. Parking is available in the courtyard. 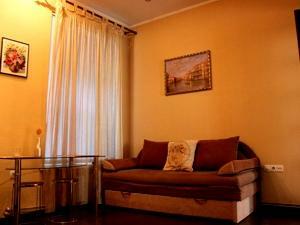 Cozy apartment in the very heart of Odessa, ground floor at 39 Bunina Str. Private entrance via a nice clean courtyard. Located at the same building as 1-bedroom 2-114. So you can book 2 apartments and stay as a group with your friends! Living room 15 sq m with a fold-out sofa, 2 armchairs, coffee table big TV with cable channels. Bedroom with a King-size bed and a wardrobe. There are glass doors between those 2 rooms. Kitchen is 15 sq m has all dishes, glass round table, chairs, fridge. Renovated spacious bathroom with Jacuzzi. Apartment has an autonomous heating system, heated floors and a good water pressure. This 1st class Odessa apartment is fitted with the following consumer electronics: TV-set with cable channels, Wi Fi Internet, air conditioner, microwave, electric kettle, washing machine, DVD, iron and ironing board, fridge. Maximum sleeps 4 persons. Parking is on the street only, or at the Athena mall nearby. Cozy 1room apartment on 7 Karetniy lane, between L.Tolstogo Street and Lyuteranskiy lane (15-20min walk to Deribasovskaya). Entrance from the courtyard, gates on code, small closed courtyard with only a couple of apartments in it. Apartment is on the ground floor, total square is 35m2, height of ceilings 2,7m. 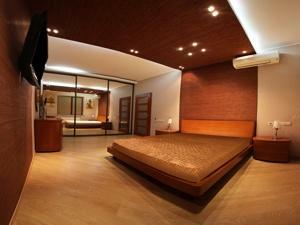 Bedroom has a Queen-size bed, built in wardrobe, working area with book shelves, big 32’ LED TV set with cable channels. Courtyard view from the windows. Bathroom has a big corner bathtub, toilet, washing basin. Apartment is equipped with LED 32’ TV set, Wi Fi Internet, fridge, air conditioner, washing machine, iron and ironing board, hair drier. Maximum sleeps 4persons. Guarded parking is on Topolskogo lane, 2 min walk. Very stylish & modern 1st floor 1-bedroom Odessa apartment jsut one block from the famous Deribasovskaya Street at 14 Tchaykovskiy lane. Walking distance to dozens of restaurants, cafes, shops and other entertainment sites. 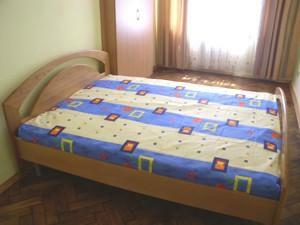 There is wide and comfortable bed in the spacious bedroom. The interior is very pleasant and disposes to relaxation. Open-concept living room with an air-conditioner. Satellite TV and a fold-out sofa. You’ll find all necessary stuff for cooking in the kitchen – oven, air-vent, fridge and all kitchen utensils. Bathroom unit has everything you need – modern shower cabin, washstand, toilet. 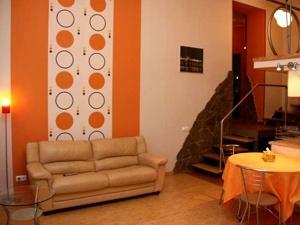 A very nice & cozy apartment in the very heart of Odessa at 14 Pushkinskaya Str. (opposite Bristol hotel and 7 min walk to Deribasovskaya). Entrance to the apartment via courtyard, front door on code, long corridor leads to the apartment. Apartment is on the third floor. 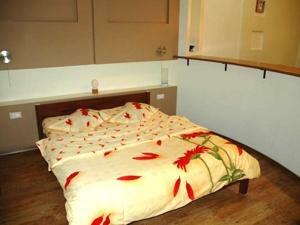 It has king size bed in the 15sq m bedroom and a modern new furniture in 20 sq m living-room. There are tiles floor in shower & WC, autonomous heating system and good water pressure. Apartment is fitted with all needed consumer electronics such as 2 TV sets with cable channels, CD, Wi Fi Internet, hair dryer, iron, fridge, air conditioner, washing machine, microwave, local phone. Maximum sleeps 4 persons. Parking is available nearby. 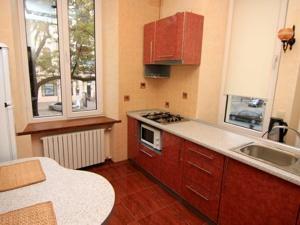 Deluxe apartment in the very heart of Odessa at 14 Gogolya Str., 10 min walk to Deribasovskaya. King size bed in the bedroom and fold out leather sofa in the living room. 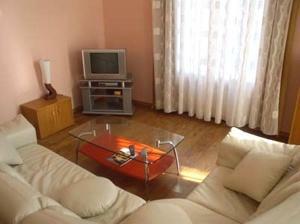 2 Air-conditioners, 2 LCD TV-sets with cable channels, microwave, electric kettle, washing machine, iron and board, hair-dryer, High-speed Internet. Maximum sleeps 4 persons. Parking is on the street. 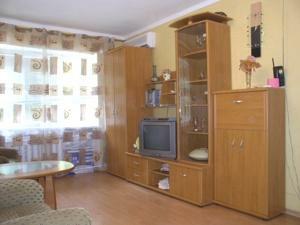 Two room flat with perfect location in the centre of Odessa at 6 Gavannaya Str. The most famous street Deribasovskaya is very close. Here you can find all sorts of entertainment and attractions. Great place to stay in Odessa, Ukraine. Fresh renovation, new expensive furniture. Modern pleasant design. Bedroom has wide dbl bed, bedside tables, Jacuzzi. Opne-concept Living room has a nice soft corner, dining area and kitchenette with all you need for cooking. Spacious bathroom unit has modern shower cabin, toilet and washbasin. For you comfortable stay this apartment has the following consumer electronics: microwave, electric kettle, fridge, air-condiotioner, heating system, iron, hair-dryer, LCD TV, DVD player, Sattelite TV, computer, Wi-Fi Internet. 1-bedroom Odessa apartment on 27 Bunina Str. (just minutes walk from Deribasovskaya Str. ) 1st floor of 3-storey building. Front door on code. All Odessa attractions, supermarket and cafés are nearby. Great place to stay in Odessa, Ukraine. There is a 18 sq m living room with 2 fold out sofas, separate bedroom has a King-size bed. Kitchen is 13 sq m with all utensils for cooking. There is a big bathroom with standard bathtub, washing machine, wash basin, toilet. This Odessa apartment is fitted with consumer electronics such as TV set with cable TV (71 channels), iron, fridge, air conditioner, washing machine, cable High speed Internet is for extra. Phone in the apartment is for local calls only. Parking is available in the yard. 2-bedroom apartment on the main street of Odessa - 18 Deribasovskaya Str. Entrance to the apartment is via courtyard, metal front door on code, good renovated corridor, first floor (there is a ground floor also). Apartment is just after 2013 refurbishment and has everything to feel at home and make your staying in Odessa pleasant and comfortable. It has king size beds in both bedrooms (bedrooms are 15 sq m and 16 sq m), modern nice sofas in the living-room. One of the sofas can be transformed into a Queen-size bed. Also there are business facilities like: computer, fax machine... and all possible consumer electronics: fridge, washing machine, dryer, 2 TV sets with cable channels, musical center, computer, Wi-Fi High speed Internet, 3 air conditioners, DVD, microwave, coffeemaker. There are tiles floor in the shower & WC, electric heating system and good water pressure. Maximum sleeps 6 persons. Parking is available at the Athens mall. 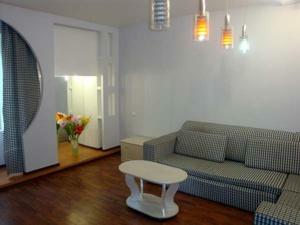 Renovated 1st class Odessa NON SMOKING apartment on 39 Bunina Street in the very heart of Odessa, ground floor. It has a King-size bed in the 15sq m bedroom, modern and cute sofa in 15 sq m living-room, small kitchenette with all dishes. There are tiles floor in big bathroom & WC, autonomous heating system and good supply. Apartment is fitted with consumer electronics such as TV set with cable channels, iron, fridge, air conditioner, microwave, electric kettle. High speed Internet Wi Fi, computer on demand. Deluxe 1 bedroom Odessa apartment located on the 2nd floor at 3-storey historic building (see photo to the right) at 2 Pushkinskaya Street close to the Odessa Opera Theater. Very spacious 100 sq. meters apartment for a reasonable price for those who is looking for luxury. 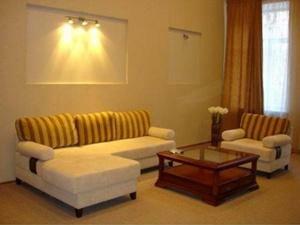 Apartment is fully furnished and equipped with all new prime quality furniture. There is a spacious living room with a white leather sofa, which could be easily transformed into the 2nd bed. Bedroom with a King-size bed, fully equipped kitchen with a dining area. Large balcony, large bathroom with standard bathtub, wash basin, toilet. 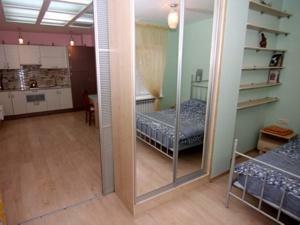 2012 Renovation 1st class 1-bedroom Odessa apartment on 9 Mayakovskogo Lane, 5 minutes walk from Deribasovskaya. Entrance from the street, front door with a key, very clean hall. 2nd floor of 5-storied building. At the entrance we get to the spacious living room 25 sq m, in which big and soft transformed sofa, 32’ LCD TV set with cable TV, air conditioner, a wardrobe, a coffee table. There is king size bed in the bedroom. The kitchen 8 sq m is equipped with all necessary built in furniture, an utensils and dining table for 2 persons. In the bathroom very comfortable washing cabin, small washing basin, washing machine, and toilet. Apartment is fitted with 32' Plasma TV set with cable TV, air conditioner, fridge, washing machine, iron and ironing board, electric kettle, hair dryer, high speed Internet Wi-Fi. Maximum sleeps 4 persons. Parking is available on the street. 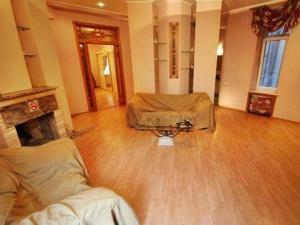 Luxury 2-roomed flat with a fresh 2012 renovation and a perfect location in the centre of Odessa at 6 Gavannaya Str. The most famous street Deribasovskaya is very close. Here you can find all sorts of entertainment and attractions. The flat is on the 2nd floor, entrance through a coded door. Stylish design creates unique atmosphere of comfort. Here you can find everything you need for a very comfortable rest after a long day of exploring Odessa: Queen- size bed, 37 Inch LCD Satellite TV (over 100 channels including English ones), DVD, PC, Wi Fi Internet, completely equipped kitchen with microwave, oven and all kitchen stuff. 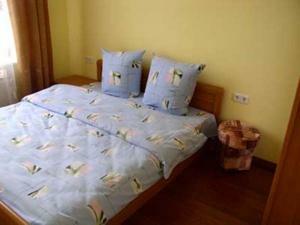 Two Air Conditioners (one in each room), personal safe, washing and dryer machine, Jacuzzi for two persons, etc. Lovely balcony with marvelous view to the City Garden (Gorsad) and Deribasovskaya Street, ideal place to have your morning coffee. 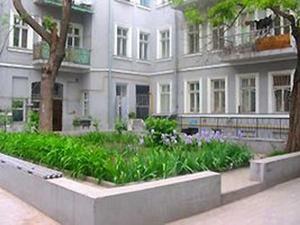 2013 Renovated 1-bedroom Odessa apartment in historical center of Odessa at 15 Grecheskaya Str. with all attractions nearby. 5 minutes walking to Deribasovskaya Street. 1st high floor apartment with a nice renovated entrance and stairs (see photo). 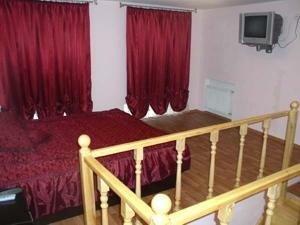 Very spacious bedroom with a Queen-size bed and a wardrobe. Huge living room with a fold-out sofa corner, TV set with cable TV channels and air conditioner. Cozy separate Kitchen with everything you need for cooking and a table for 4. Small size bathroom with a shower. High speed Internet. Maximum sleeps 4 persons. Parking is available in the quiet courtyard. 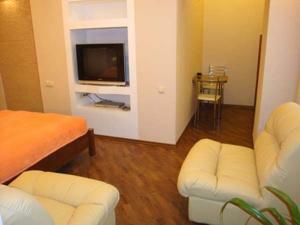 One room Odessa apartment located right in downtown at 12 Sobornaya Sqr. just 5 min walk to the world-known Deribasovskaya. Entrance via typical Odessa courtyard, renovated corridor, front door on key. Apartment is situated on the ground floor of 2-storey building. At the entrance to the apartment we get into small kitchenette, with all necessary furniture, microwave, electric kettle, refrigerator, coffee table. Then, via a small corridor we get to 18m2 bedroom with convenient double bed, LCD TV set with cable channels, dresser, mirror, air conditioner. Bathroom is combined with an angular shower cabin, washstand, toilet. Apartment is equipped with LCD TV set with cable channels, air conditioner, microwave, electric kettle, refrigerator. Autonomous heating system with good water pressure round the clock. Maximum sleeps 2 persons. Parking is available on the street. 1-bedroom premium class apartment on 7 Gavannaya Street. 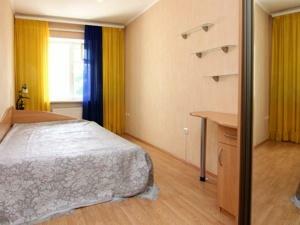 Perfect location near “Kumanets” restaurant and just 1 minute walk to Deribasovskaya Str. Entrance via good courtyard, renovated corridor, coded door. Apartment is situated on the first floor. There is a 18 sq m living room with a fold out sofa, big plasma TV set. Small kitchenette has all utensils for cooking. Spacious bedroom with a King-size bed, big closet, balcony. 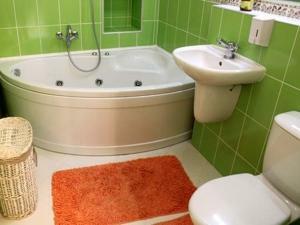 Lovely tiles floor in bathroom, corner bath tub, toilet, washing basin. Apartment has an autonomous heating system and a good water pressure. It's fitted with such consumer electronics, as bid plasma TV set with 79 channels, washing machine, microwave, air conditioner, electric kettle, iron, hair dryer, high speed Internet (cable modem). Parking is available in the yard. 1-bedroom premium class Odessa apartment at 34/36 Ekaterininskaya Str., between Yevreyskaya and Zhukovskogo Streets. 15 minutes walk to Deribasovskaya. 2nd floor of 5-storey building. 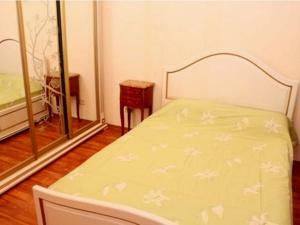 16 square meters Bedroom with a King-size bed, big mirror closet, LCD TV with cable channels, Air-conditioner. Huge 20 sq. 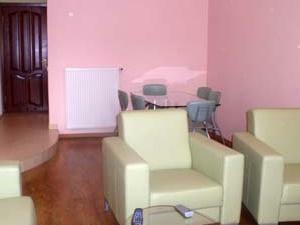 meters living-room with a modern sofa, LCD TV and High-speed Internet. Modern Kitchenette with all amenities included. Washing machine. Spacious renovated bathroom with Jacuzzi. Autonomous heating system and good water pressure. This lovely apartment will pleasantly surprise you. It has a very good downtown location at 14 Voenniy Lane (Viis'kovyi Descent as it's says on the map in Ukrainian), very close to all what you can need – bars, restaurants, shops and other entertainment. Clean entrance. You can park in the yard. 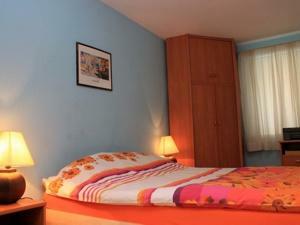 This wonderful flat has everything for comfortable stay. Two rooms – one bedroom and one living-room. The interior is done in warm colours and it makes you feel like being at home. Bedroom is calm. There is one Queen-size bed and a wooden chest of drawers in it. In addition, there is a balcony (see photo below) with a nice coffee table and two chairs. It’s an ideal place for having breakfast or tea time before going to bed. Open-concept Living room is rather spacious - dining area with all necessary kitchen stuff and a splendid white leather sofa and the same chairs. Two large windows with nice curtains will fill the room with light when you need it. Excellent place to relax. Bathroom unit with a large bath, toilet, washstand and a mirror. Recently renovated 35 sq.m. one-room studio apartment located on the ground floor on 9 Sofievskaya Str., close to Komsomolskiy boulevard and 15 min walk to Deribasovskaya. Sofievskaya St. is nice quiet street close to Odessa downtown.Located at the same building as another 1-room apartment 1-006. There is a wide fold-out sofa which could be transformed into a bed in 17sq m room. There are old style tiles on the floor in the bathroom, shower cabin, toilet. Apartment is fitted with all needed consumer electronics. The phone in the apartment is for local calls only. Maximum sleeps 2persons. Parking is available nearby. 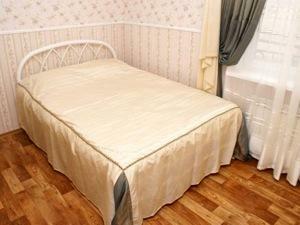 Cozy 2-room flat in the very centre of Odessa on 19 Lanjeronovskaya Street. Private entrance from the courtyard, front door to two flats 2-080 and 2-081. Total square is 37 sq m, 1st floor. Not guarded parking on the street and guarded parking on Gavannaya Street. Upon entering apartment we get into an open-concept Living room of 18 sq m. Here you can find a comfortable roll-out sofa, dining table, kitchen, plasma TV and a modern Kitchenette with all amenities. Courtyard view from the windows. 12 sq m bedroom offers a Queen-size bed and a wardrobe for your clothes. Quiet yard view from the windows. Bathroom unit with a toilet, washbasin, large corner bath and a shower cabin. 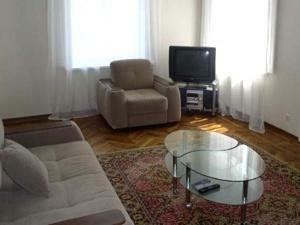 Flat has been recently renovated, everything is new and of high quality. Fridge, air-conditioner, electric stove, microwave, electric kettle, washing machine, safe box, hair-dryer, Internet Wi Fi, plasma TV 26" with cable channels, DVD. Autonomous heating system, perfect water supply. 1st floor 1- bedroom apartment with enviable location in the very centre of Odessa, on 19 Evreyskaya Street (corner of Rishelyevskaya). 5 minutes of walking to Deribasovskaya. Entrance from the courtyard. Enviable location in the very centre of Odessa, on Evrejskaya Street corner of Rishelyevskaya. 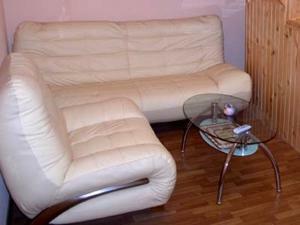 NON SMOKING Business class 1-bedroom Odessa apartment on 24 Preobrazhenkskaya Str. just few min walk to Deribasovskaya. 2nd floor. Entrance via courtyard, gates to courtyard are on code. Renovated corridor. There is spacious living room with a fold out bed, big LCD TV set 42’ with Satellite TV, Home theatre, High speed Internet Wi Fi. From the living room entrance to the dining room and small kitchenette with all the stuff for cooking, microwave, fridge, gas stove, telephone. There is a dining area with a glass table and comfortable chairs, working area with a desk for computer. Nice bedroom with a King-size bed, built-in wardrobe. 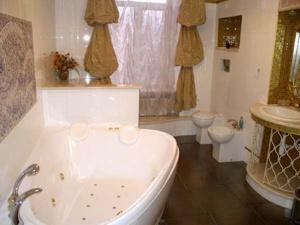 Also you’ll find there a nice bathroom with Jacuzzi tub, entrance to the bathroom from bedroom and from living room. Apartment has an autonomous heating system, very good water pressure, 1000 liters tank for extra water supply. The deluxe Odessa apartment is fitted with all needed consumer electronics such as LCD 42’TV set with Satellite TV, home theatre, DVD, washing machine, air conditioner, High speed Internet Wi Fi, microwave, fridge, hair dryer, iron. You'll also find there such a things like bathrobes, umbrella, shoes kit. Local calls within Odessa are free of charge. Parking is available in the courtyard. Cozy small apartment on 34 Pushkinskaya Street, corner Yevreyskaya Street, 15 minutes walk from the famous Deribasovkaya street. Apartment is on the 1st floor of a 3 storey building. Entrance via nice courtyard, standard corridor. At the entrance we get into the 8sq m kitchen, bathroom is on the right, room is on the left. 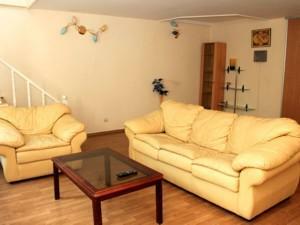 Apartment is fully furnished, there is a Queen-size bed, 2 armchairs, small kitchenette with all allyou need for cooking. Apartment is fitted with AC, TV set with cable channels, microwave, washing machine, phone, High speed Internet Wi Fi, fridge, electric kettle, iron, hair dryer, electric boiler for hot water. Parking is available in the courtyard. Recently renovated NON SMOKING 1st class modern 2-bedroom Odessa apartment on 29 Bunina Str., between Aleksandrovskiy Avenue and Ekaterininskaya Street. 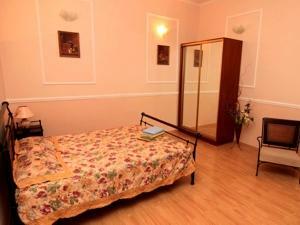 Very good location in the very heart of Odessa, just 5 min walk to Deribasovskaya! Modern luxurious new red leather furniture, fold sofa, arm-chair, coffee table, big dining table and chairs, 32’ LCD TV set in the living-room. Queen-size beds and wardrobes in both bedrooms. Bathroom with a corner Jacuzzi, autonomous water-supply 24/7, water tank of 500 liters, autonomous heating system. Apartment is fitted with all needed consumer electronics such as fridge, air conditioner, microwave, iron, hair drier, DVD, home cinema, washing machine, 32’ LCD TV with satellite 600 channels, High speed Internet Wi Fi, computer on demand for free is included in the rate. Modern 2-level 2-bedroom apartment in Odessa. Located on 19 Deribasovskaya Str. right across the Europe centre. Perfect place for a family of 4 or even 6. Entrance from courtyard, door on coder, good renovated corridor. Apartment is on the second floor of 3 storey building. There is spacious living room 30 sq m with kitchenette and bathroom on the first level, ceilings are 5 m, two bedrooms 18 and 16 sq meters are on the second level, second bathroom with shower is on the second level also. Apartment has a nice furniture and good renovation. This 2-bedroom apartment is fitted with an air-conditioner in each room, TV set with cable TV in each room, DVD, washing machine, iron and ironing board, fridge, hair dryer. Parking is available at the Athena mall or at Ekaterininskaya street. One of the most luxurious 1-bedroom apartments in Odessa. Located at 17 Rishelievskaya Str., corner of Zhukovskogo Str., just 10 min walk to Deribasovskaya. Huge 55 sq.meters open-concept living-room with a hold-out round bed, Plasma TV (Satellite), High-speed Internet. Kitchenette with all amenities included, Microwave, dishwasher. Bedroom with a King-size bed and a mirror. Spacious wardrobe, Air conditioner. Spacious bathroom with Jacuzzi. Autonomous water supply and system of heating. Nice cozy studio Odessa apartment on 2 Vice Admiral Zhukov lane, just around the corner from Deribasovskaya Street and close to famouse Gambrinus restaurant. Entrance via courtyard, apartment is on the ground floor, separate entrance from the courtyard. Entering the apartment you get into small hall, from the hall to a room. In the room there is a big bed - sleeping area. 2 arn-chairs and small table - siting area. Kitchenette with all needed utensils for cooking. Bathroom with big jacussi tub. Maximum sleeps 2 persons. Parking is on the street only. Nice & cozy recently renovated NON-SMOKING Studio at 24 Preobrazhenskaya Str., 2 min walk from Deribasovskaya Str. in a quiet courtyard with parking space available. Gates to courtyard are on key, renovated entrance hall. There is a room with a Queen-size bed, LCD TV set with Satellite channels, small kitchenette with all the stuff for cooking, microwave, fridge, gas stove, dining area with a glass table and comfortable chairs. Bathroom with standard bathtub, shower and curtain. Apartment has an autonomous heating system, very good water pressure. This studio apartment is fitted with all needed consumer electronics such LCD TV set with satellite channels, DVD, washing machine, air conditioner, High speed Internet Wi Fi, microwave, fridge, hair dryer, iron and ironing board. One more advantage of this apartment is a spacious terrace, where you can have a morning tea or a coffee. You'll also find there such a things like bathrobes, umbrella, shoes kit. Local calls within Odessa are free of charge. VIP 1-bedroom spacious apartment located in the historical center of Odessa at 7 Risheleyevskaya Str., close to Buffalo restaurant, 2 min walk to Deribasovskaya Str. Renovated entrance hall, coded door. 2nd floor of 3-storey building. King-size bed, fold-out sofa, Cable TV, Air-conditioner, High-speed Internet, CD player, hair dryer, microwave, washing machine. Autonomous heating system and good water supply. Beautiful very spacious apartment on 5 Gogolya Street with a magnificent view of the Black sea, Teschin bridge and Primorskiy boulevard. Apartment is on the first floor (there is a ground floor also), entrance from good courtyard, renovated corridor. Total area of the apartment is over 200m2, ceiling height 2.5-5m. At the entrance you to get into the small hallway, there is also a guest toilet. Then pass on to the dining room, where the kitchen has a highlighted glazed wall and a dining area with a table and chairs. Next, get into the room where the living room is with comfortable sofa and armchairs. From the living room there is the corridor with 3 separate rooms: cabinet 10m2, 15m2 bedroom with a sofa bed, air conditioning: bedroom 28m2 with a Queen-size bed, air conditioning and a stunning panoramic view of the sea. From the living room stairs lead to the second level where there are 2 bedrooms. The first Junior bedroom is 15m2 on the right side, it has separate 10m2 bathroom with shower, there is also access to the dressing room of 6m2. This bedroom has air conditioning. 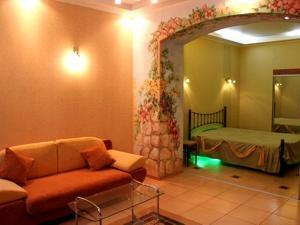 The second bedroom is 17m2 it has air conditioner, separate 10m2 bathroom with a Jacuzzi, a dressing room 8m2. This 5-room apartment has: 4 air-conditioners, 2 TV sets with cable TV, High speed Internet Wi Fi, DVD, electric kettle, iron, hair dryer, local phone, microwave. Parking is available on the street. 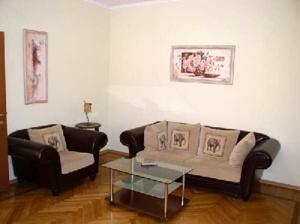 Business class very spacious 2-bedroom Odessa apartment on 25 Bunina Str. just 5 min walk to Deribasovskaya Street. 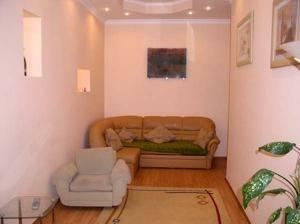 NON SMOKING Studio apartment (40sq m) with nice paintings on the wall, ground floor, separate entrance to the apartment. 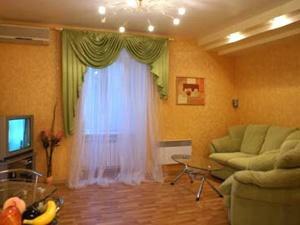 Perfect downtown location at 14 Sadovaya Str., 5 min walk to Deribasovskaya. Everything is very fashionable and new, complete renovation was made in 2010. Ceilings are 3m. It has a set of marvelous forged furniture: huge double bed, two arm-chairs and wonderful coffee table. There are tiles floor in bathroom, Jacuzzi bathtub, perfect water pressure, autonomous heating system which will provide you with a hot water whenever you need it. Heated floor in the apartment will make you staying pleasant and comfortable. Apartment is fitted with such consumer electronics as fridge, electric kettle, gas cooker, TV with cable channels, DVD, microwave, Air-conditioner, High speed Internet cable modem, local phone. Maximum sleeps 2 persons. Parking is available in the courtyard, in front of the windows. 1-room recently renovated Odessa apartment on 23 Grecheskaya Street, very close to Ekaterininskaya Street and just 5 min walk to Deribasovskaya. Apartment is located on the 2nd floor of 4-storey building, entrance via standard corridor. There is a 20 sq m room with a Queen-size bed, closet, TV set with cable TV channels. Separeted Kitchen is 6 sq m, it has everything for cooking. Small size bathroom trimmed with ceramic bar, bathroom and WC are combined. This studio apartment is equipped with: air conditioner, washing machine, CD player, TV set, fridge, iron, High speed Internet Wi Fi. Maximum sleeps 2 persons. Parking is available in the courtyard. 5th floor 1 bedroom apartment on 42 Evreyskaya street - quiet center, 10 minutes walk to Deribasovskaya Street ad 20 min walk to the beach. Entrance through the courtyard, clean corridor. At the entrance to get into the hallway, from the hallway to 2 separate rooms - a living room with a balcony and a bedroom. Each room could be closed with a door. Bathroom has a standard bathtub, washing machine, wash basin. 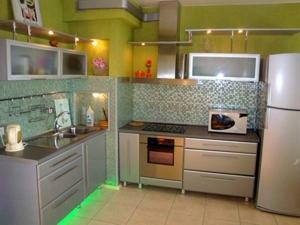 Cozy Kitchen of 6 square meters, there is fridge, microwave, electric kettle all utensils for cooking. Unguarded parking is at the courtyard. 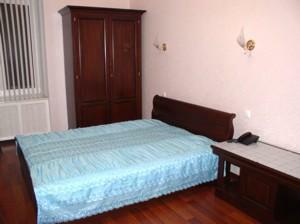 1st floor 1-bedroom Odessa apartment in historical center of Odessa at 39 Bunina Str. with all attractions nearby. It’s only a few min walk to the most famous street of Odessa – Deribsovskaya, where you can find all you need – restaurants, cafes, shops and other entertainment. There is wide and comfortable Queen-size bed and air-conditioner in the bedroom. The interior is very pleasant and disposes to relaxation. Italian leather furniture in the living room creates a unique cozy atmosphere. You can spend your time here watching cable TV. Heated floors will add some comfort too! You’ll find all necessary stuff for cooking in the kitchen – oven, air-vent, fridge and all kitchen utensils. Bathroom unit has everything you need – modern shower cabin, washstand, toilet. One room small & cozy Odessa apartment at 18 Ekaterininskaya Street, just around the corner from the famous street of Odessa downtown - Deribasovskaya. Entrance to the apartment via courtyard, then standard corridor. Apartment is situated on the ground floor of a 4 storey building. There is a 17sq m room with a Queen-size bed, closet, 2 arm-chairs, coffee table, TV Set with cable channels. 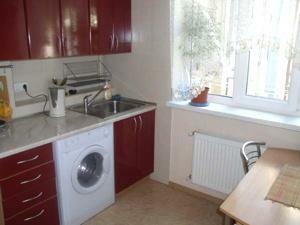 Small kitchenette 10sq m is separate, has everything for cooking. 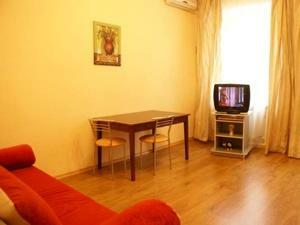 Apartment is equipped with TV, microwave, AC, washing machine, CD player, High speed Internet Wi-Fi. Maximum sleeps 2 persons. Parking is on the street, or at the Athens Mall. Nice & spacious Business class 2 bedroom apartment in Odessa downtown right on the famous Vorontsovsky Lane 13 (with Potemkensky Stairs view) - a perfect place to stay for up to 7 people right at the centre of Odessa. Private entrance via a renovated corridor, front door on magnet lock. Good deluxe repair, high quality furniture and consumer electronics will make your staying in Odessa pleasant and comfortable. Apartment has a King-size bed, wardrobe, drawer in the master bedroom of 20 sq,m and fold-out sofa and a desk for work in the 2nd bedroom. Modern furniture, TV set, home cinema and AC in the 20 m2 living-room. There are tiles floor in bathroom & WC, autonomous heating system and good water pressure. The apartment is fitted with all needed consumer electronics such as TV set with cable channels iron, fridge, 2 air conditioners, CD, DVD, home cinema, microwave. Parking is available in the courtyard, courtyard is guarded, good security system, video control. Spacious 85 sq.m. 2-bedroom Odessa apartment with high ceilings in the very heart of Odessa, at 25 Ekaterininskaya Str., corner Grecheskaya, 1 block away from Deribasovskaya Str. Autonomous heating system and good water supply, 2 Queen-size beds and a fold-out sofa in the living room. Cable TV, 3 air-conditioners, CD & DVD, high-speed Internet Wi Fi, phone, electric kettle, washing machine, bathtub and a shower cabin. Sleeps up to 6 persons! Parking space is available in the courtyard. 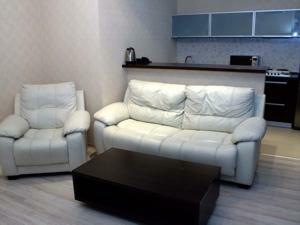 Recently renovated NON SMOKING Business class 1-bedroom Odessa apartment located on 1 Ekaterininskaya Sqr. 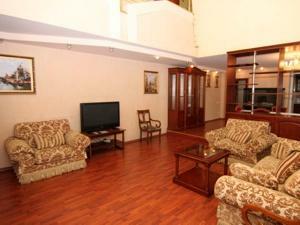 in a very prestigious building with tremendous view on the Black sea and the Potemkin Stairs. As many Odessa dwellings it is situated in a beautiful historical 3-storey building with high ceilings. The unique picturesque window view on the sea and Potemkin stairs should attract you. Close disposition to the embankment, no traffic noise and all necessary facilities will make your stay in Odessa an unforgettable one and will persuade you to visit this city for the second time. This modern apartment is decorated in a European style with every necessary thing being at hand. In a bedroom you will find a king size bed with a wardrobe to keep your things there. In a living room there is a sofa and a small table with a chair to make you feel like at home reading a newspaper or watching 32' LED TV (600 satellite channels) or listening to your favorite CD/DVD player. And at the kitchen you'll find all necessary facilities, i.e. gas-cooker, oven and a fridge that will render you a helping hand while cooking your favorite dishes. Powerful air-conditioner and electro water heating leave no place for such problems as water absence or high temperature outside. The bathroom with a modern massage shower cabin will cheer you up after your long sightseeing about Odessa. All this together with good disposition and Odessa’s picturesque places will make you fall in love with Odessa forever! There is “Boulevard” restaurant on the ground floor of the same building – so you can easily order breakfast. Non smoking Odessa Apartment! 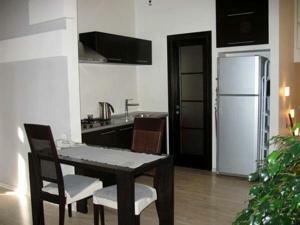 Studio apartment located at 16 French boulevard (district of Silpo for those who know Odessa). 17th floor Odessa apartment with an amazing view from the windows. 10 min walk to the beach and 15 min drive to the city center. 40 square meters studio with a modern fold out sofa and new fold out armchair, huge wardrobe, balcony. Cable TV, WiFi Internet, DVD, air conditioner, microwave, hair dryer. Maximum 3 people. Street Parking is available nearby. Mini hotel at 24 Grecheskaya Str. (corner Rishelievskaya Str.) just 3 min walk to the famous Deribasovskaya Str. 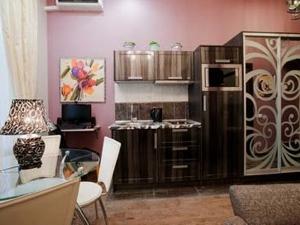 Six 1-st class apartments (2-023, 2-024, 2-025,2-026,2-027, 2-028) are offered for guests of Odessa. Two-room / 1-bedroom cozy apartment in the very heart of Odessa, second floor. It has king size bed in the 12sq m bedroom, modern leather furniture sofa and 2 arm-chairs in 28 sq m living-room, small kitchenette.There are tiles floor in shower & WC, autonomous heating system and water supply. 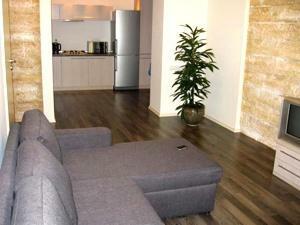 Apartment is fitted with consumer electronics such as TV set with satellite (400 channels), iron, fridge, air conditioner. Perfect entrance via renovated corridor, nice view from big windows, very sunny and nice apartment. Phone in the apartment is for local calls only. Renovated 1-bedroom apartment located in the center of Odesa at 30 Sofievskaya Street corner Preobragenskaya street and 10 min walk to the main street of Odessa - Deribasovskaya. 2nd floor (there is a ground floor also) Odessa apartment with 2 private rooms. View from the all the windows are back side courtyard yard, very quiet, no neighbors. At the entrance to the apartment we get to hall 6m2, from this hall we enter bedroom 15 m2 on the left, 18 m2 open-concept living room and kitchenette on the left and bathroom in front. Bedroom has a Queen-size bed, wardrobe, arm-chair, two real marble night tables. There is fold-out comfortable sofa, TV set with satellite channels, air conditioner in the living area, fully equipped kitchen with all the dishes, dishwasher, washing machine, oven, electric kettle, filter for water, fridge. Bathroom has a shower, toilet, washing basin.Apartment is fitted with autonomous heating system, autonomous water supply, tank for extra water. Apartment is equipped with necessary appliances, such as: TV (satellite channels), refrigerator, washing machine, air conditioner, dishwasher, electric kettle, iron and ironing board, hair dryer, water filter, High speed Internet Wi Fi. Maximum sleeps 4 persons. Guarded parking is available on Nekrasova lane. Newly renovated NON SMOKING 2-bedroom apartment on 42 Nezhinskaya Street, 5 minutes walk to Sobornaya Square, 10 min to Deribasovskaya Street. Entrance to the apartment via a courtyard, separate corridor, no neighbors, telecom system. Entering the apartment you'll get into the main hall and then to the living room with a fold out sofa corner. There are 2 separate bedrooms with Queen-size beds. Cozy Kitchen is not very big, but very pleasant, made in nice warm colors. Gas oven, dishwasher, big fridge. Bathroom is very nice and bright, with a double Jacuzzi tub. Apartment has an autonomous heating system, good water pressure. Consumer electronics such as TV set with cable TV 79 channels, DVD player, washing machine, dishwasher, air conditioner, iron & boards, hairdryer, phone, High-speed Internet modem. Parking in the courtyard. 1-room recently renovated NON-SMOKING Odessa apartment on the famous downtown street 8 Vorontsovskiy lane, close to Potemkin stairs, 2 min walk to Primorskiy boulevard and just 10 min walk to the world-known Deribasovskaya. Quiet location in the very heart of Odessa. Apartments 1-013, 1-014 and 1-015 are on the same corridor. 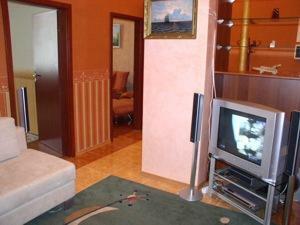 Total square of this modern apartment is 50sq m. Apartment is divided into 3 different areas: sleeping area with king size bed, big LCD TV set, night table is on the second level; living area with made of white leather coach, coffee table, TV set, built in closet; small kitchenette with all necessary furniture and utensils. Fully equipped with: 32’ LCD TV set, air conditioner, fridge, washing machine, iron and ironing board, electric kettle, one more big TC set, hair dryer, high speed Internet Wi Fi, satellite TV. 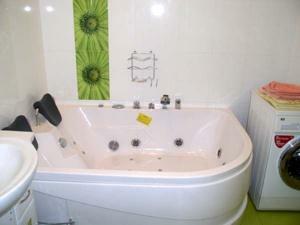 Bathroom has the Jacuzzi bathtub, washing basin, heated towel-rail, toilet. Apartment has an autonomous heating system, heated floors. Maximum sleeps 2 persons, pets are not allowed. Parking is available on the street. Very cozy Odessa apartment, located in the central part of Odessa at 18 Polskaya Street (5 minutes walk to Deribasovskaya, 3 minutes to Shevchenko Park). Modern and sunny accommodation for a couple who don't want to spend much on apartment, but at the same time enjoy all the basic amenities: comfortable Queen-size bed, air-conditioner, microwave, Satellite TV, phone, electric kettle, hair dryer, etc. Mini hotel located on the 2nd floor at 24 Grecheskaya Str (corner Rishelievskaya Str), 3 minutes walk from Deribasovskaya. Six identical 1-bedroom apartments 2-023, 2-024, 2-025, 2-026, 2-027 and 2-028 renovated in 2007. Two-rooms/1-bedroom cozy apartment in the very heart of Odessa, second floor. Entrance from the street, front door on code, standard corridor. Apartments is 55 sq m, ceilings 3m. It has a King-size bed in the 15sq m bedroom, modern leather sofa in a 35 sq m living-room, small kitchenette. There are tiles on the floor in shower & WC, autonomous heating system and good water pressure. Apartment is fitted with consumer electronics such as TV set with satellite (400 channels), iron, fridge, air conditioner, High speed Internet wi fi. Maximum sleeps 4 persons. Parking is on the street or guarded parking in Athena Mall. 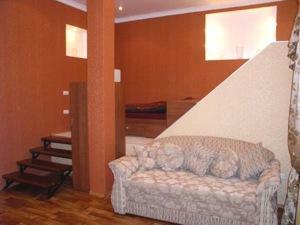 Small & cozy 1-room apartment is located near the main streets of Odessa at 18 Nejinskaya Street. Entrance to the apartment is via courtyard, front door is on code. At the entrance to the apartment we get to the 13sq m kitchen, from kitchen entrance to the 12 sq m bedroom, bathroom. There is a double bed TV set with cable channels in bedroom. 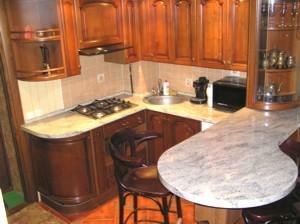 Kitchen is fully equipped, there is kitchen furniture, dining table with chairs. This apartment is fitted with all needed consumer electronics such as TV set with cable channels, air conditioner, fridge, washing machine, electric water heater, CD player, iron, phone. Good accommodation for guests who do not want to stay on noisy Deribasovskaya str., for guests who would like to live in quiet area and to be not far from all main attractions. Parking is available on the street, guarded parking is within 5 minutes walk. Nice and comfortable 2nd floor 1st class Studio apartment in Odessa located close to Odessa downtown on 8 Vorontsovsky Lane - a small lane of an old Odessa, famous because of it's One Wall Building. Many movies have been filmed there. 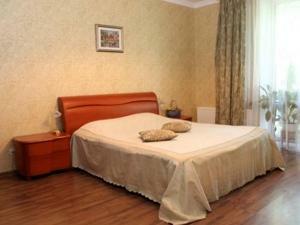 Prime downtown location just 2 min walk to the famous Primorskiy Boulevard and 10 min walk to Deribasovskaya Street. Very quiet location at the city center. Entrance by metal stairs via recently renovated corridor, yard gates on code lock, parking space is in the yard. This cozy apartment for 2 has everything you need for a comfortable stay: King-size bed, air-conditioner, Satellite TV, sofa, washing machine, electric water heater, high-speed Internet. Book if for your Odessa visit now! 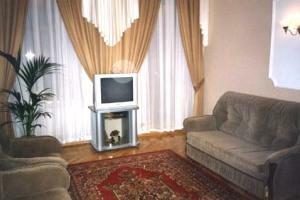 Deluxe very spacious Odessa apartment with a real fireplace at 38A Koblevskaya Str. Entrance to the apartment via yard, yard gates are on code. Murmur stairs to the second floor. Close to all main attractions of Odessa. Quiet location in Odessa downtown. 5 min walk to Deribasovskaya Str. and 10 min to Noviy Rynok (market). 2 King-size beds and a fold-out sofa bed with an othopedic mattress in 3 bedrooms. Modern and comfortable living room. Satellite TV, air-conditioner, microwave, washing machine, musical center, video player, High-speed Internet. Parking is available within walking distance. One room Odessa apartment on 4 Bazarnaya Str, 10 min walk to the Lanzeron-Otrada beach, 10 min drive to Arcadia, 20 min walk to Deribasovskaya StreetPrivate entrance via a clean courtyard. Its total square is 33 m2, apartment is just after refurbishment. When we enter the apartment we get into kitchenette (8m2), then entrance to the room (22m2) and entrance to the bathroom with a big angular bathtub, toilet and washing basin. Queen-size sofa, Cable TV, DVD, Air conditioner, refrigerator, hair dryer, iron, Microwave, electric kettle, washing machine. Maximum sleeps 2 persons. Parking is within 2 min walk. Comfortable Odessa apartment right on the main street of Odessa - 13 Deribasovskaya Str., right between Frappoli hotel**** and Irish Pub and minutes away from the main attractions of Odessa downtown. 2nd floor, Front door on code, recent renovation, perfect location! Rent it today! This modern Odessa studio apartment consists of a huge room divided with a bar table for a sleeping area and living room area. Sleeping area has a King-size bed and a mirror closet. Living area has a huge light leather sofa which can be transformed into a double sleeping place if needed, a glass coffee table, TV with cable channels, DVD and many other small things creating a very unique style. 1 bedroom/studio cozy 2 level Odessa apartment on 21 Preobrazhenskaya Street (corner of Deribasovskaya). Odessa Mini hotel for 3 units. Entrance via good courtyard, renovated corridor, coded entrance to the courtyard, central door on lock. First floor of 2 stored building. This renovated apartment has all Odessa traveller needs for a comfortable stay: Wi Fi Internet, phone, 2 TV-sets with cable channels, air-conditioner, microwave, washing machine, dryer, fridge, iron and hair dryer. Autonomous heating system and good water supply. Parking is available in the yard. This renovated apartment has all Odessa traveller needs for a comfortable stay: Wi Fi Internet, phone, 2 TV-sets with cable channels, microwave, washing machine, dryer, fridge, iron and hair dryer. Autonomous heating system and good water supply. Parking is available in the yard. 3-level 2-bedroom deluxe Odessa apartment with high ceilings in the very heart of Odessa, at 16 Sadovaya Str. (just 3 minutes away from the famous Deribasovskaya). First floor of a 3 storey building. Entrance from the street via good renovated corridor. Opening the main door of the apartment you’ll get into the hall and kitchen. On the left hand there is a living room with a balcony and from the living room there is an entrance to the first bedroom. In the bedroom there is a king size bed, big wardrobe, dressing-table. Living room is very spacious with fantastic nice antique furniture, piano which is more then 120y.o. Fold out coach, two armchairs will help you to feel comfortable in this apartment. Also from the hall you'll get into the kitchen, dining room. Passing kitchen you’ll get into the small corridor, were there would be the guest toilet on your right, big bathroom in front of you. Stairs to the second level. The second bedroom is upstairs, it has its own bathroom with a shower cabin and a toilet. Two TV sets 29’ and 21’ with cable TV, DVD, microwave, washing machine, coffee machine, electric kettle, fridge, intertelecom system, 2 air conditioners. The windows offer a wonderful view to Sadovaya Street. Parking is available on the street only, no courtyard. Mini hotel located on the 2nd floor at 24 Grecheskaya Str (corner Rishelievskaya Str), 3 minutes walk from Deribasovskaya. Six identical 1-bedroom apartments (2-023, 2-024, 2-025,2-026,2-027, 2-028) renovated in 2007. Two-rooms / one bedroom cozy apartment in the very heart of Odessa, third floor. It has a King-size bed in the 12sq m bedroom, modern made of leather furniture sofa and 2 armchairs in 28 sq m living-room, small kitchenette. Tiles floor in shower & WC, autonomous heating system and water supply. Deluxe 2-bedroom Odessa apartment on Sadovaya Str., 5 minutes walk to the famous Odessa Deribasovskaya Str. and just 2 min walk to Grecheskaya Sqr. High second floor with renovated entrance, this apartment has all you need for a comfortable stay: 2 King-size beds, fold-out sofa, 2 Plasma TV-sets with 75 Satellite channels, High-speed Internet, 3 Air-conditioners, fire place, microwave, washing machine, Jacuzzi, electric kettle. If you are visiting Odessa with a family or friends and you are thinking about something spacious and nice - take a look at our 3-bedroom deluxe apartment in Odessa downtown located on 35 Bazarnaya Str. (corner of Pushkinskaya Str. 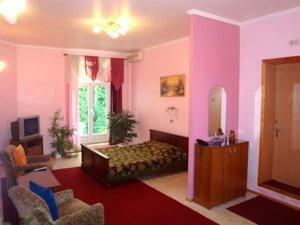 ), 15 min walk to Deribasoskaya and 20 min to the beach area – Otrada, Lanzheron beaches. Deluxe and new Odessa apartment, total square is more than 200 sq m., entrance via a standard corridor, metal stairs, first floor. Ceilings are 3 m.
There are three private bedrooms. First bedroom is 13 sq m it has a fold out green sofa and 2 arm-chairs covered with natural green leather. 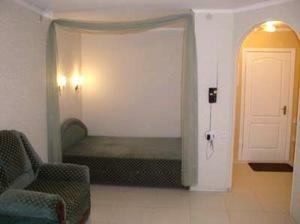 Second bedroom is 25 sq m with a brown furniture, king size bed, big wardrobe, balcony. Third bedroom is 26 sq m – master bedroom with a private bathroom. There is nice and good quality king size bed, and a wardrobe. Dark color furniture. Bathroom with toilet and shower cabin. Living room is 20 sq m, it has a nice soft furniture, TV set. From the living room entrance to a big dining room – 30 sq m, small kitchen with a new modern furniture. 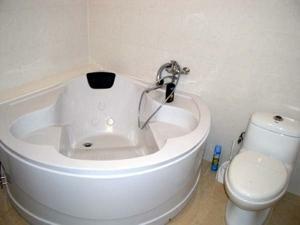 There is bathroom with Jacuzzi bathtub, toilet and wash basin. Techniques: TV set, 3 air conditioners, iron and ironing board, fridge, telephone, microwave, electric kettle, washing machine, High Speed Internet wi fi. Parking is available nearby. Monthly lease payment include: apartment rent, utilities, i.e. local telephone, water, SAT-TV, Hi-Speed Internet Wi Fi. Nice and cozy 1st floor Odessa apartment in a quiet courtyard at 24 Preobrazhenskaya Str Fully renovated and come with all the necessary amenities and equipment to make our guests feel at home. Living area with a fold out dbl coach, kitchenette, bathroom, and sleeping area with a Queen-size bed. The maximum capacity of the apartment is four adults. Kitchenette has all necessary cooking amenities, cutlery, plates, dining table, 4 chairs. Bathroom has a shower cabin with stand shower, washing basin, toilet. Apartment has autonomous heating system, good water pressure. Apartment is completely furnished and equipped to the highest standards: 21' LCD TV/Satellite 600 channels, DVD, High speed Internet Wi Fi, local phone, fridge, washing machine, microwave, hair dryer, iron and ironing board, air conditioner, PC on demand for free. There are also bathrobes, umbrella, shoes kit, sewing kit, sleepers, safe box. Parking space is at the locked courtyard. 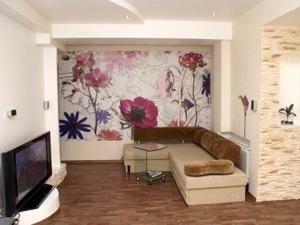 First class 1 bedroom Odessa apartment at 5/7 Mendeleeva Str. (on the intersection with Gavannaya strets), very close to Deribasovskaya and 3 min walk to the famous Potemkinsky Stairs and Odessa sea-port. Prime downtown location at the very center of Odessa, surrounded by most beautiful sightseeing in Odessa and best restaurants, cafes, night clubs and malls. Apartment is located on the 2nd floor of 4-storey building renovated inside/out, with a locked front door. Building is located in the quiet courtyard with a locked entrance gate. All possible consumer electronics: telephone, high-speed Internet, cable TV, DVD player, gas stove, microwave, refrigerator, electric kettle, washing machine, iron and board. Two-rooms / 1-bedroom newly renovated cozy apartment in the quiet part of Odessa center on 3 Lyuteranskiy Lane, close to Novoselskogo and Dvoryanskaya Streets. Odessa Conservatoire is around the corner. 15 minutes walk to Deribasovskaya Street. Second floor apartment (50 sq m) with a Queen-size bed in the bedroom and comfortable sofa at the living-room, kitchen with all amenities. Apartment is fitted with consumer electronics such as TV set with satellite (400 channels), iron, fridge, air conditioner, High speed Internet wi fi. Maximum sleeps 4 persons. Mini hotel located on the 2nd floor at 24 Grecheskaya Str (corner Rishelievskaya Str), 3 minutes walk from Deribasovskaya. Four identical 1-bedroom apartments 2-023, 2-024, 2-025, 2-026, 2-027 and 2-028 renovated in 2007. 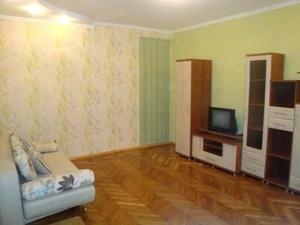 Two-rooms/1-bedroom cozy apartment in the very heart of Odessa, second floor. Entrance from the street, front door on code, standard corridor. Apartments is 55 sq m, ceilings 3m. It has a King-size bed in the 15sq m bedroom, modern leather sofa in a 35 sq m living-room, balcony with a nice view, small kitchenette. There are tiles on the floor in shower & WC, autonomous heating system and good water pressure. Nice 2-bedroom Odessa downtown apartment with a tremendous sea-view - 4th floor at 1 Torgovaya Str., (Komsomolskyy boulevard and Potemkinsky Stairs are just 10 min walk) that can become a cozy home a family with a kids. Great sea-view, close to Primorsky boulevard, working elevator. Welcome to your Odessa home! There is a living room with 2 fold out sofas, big TV set. From living room you can get to both small 10 sq bedrooms. In one bedroom there is a king size bed an a wardrobe, in another – fold out sofa and a wardrobe. There is also a small balcony with terrific view. Kitchen with all the amenities, dining area. Apartment fitted with fridge, gas-stove, electric kettle, cooking battery, washing- machine, electro-boiler, air conditioner. 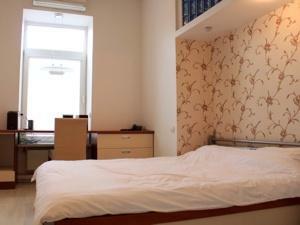 Nice and comfortable Business class 2-bedroom Odessa downtown apartment on 34/36 Ekaterininskaya Str. (close to Evreyskaya Str. and no more than 15 minutes walk to Deribasovskaya Str ). Very spacious apartment (each room is 20 sq. meters!) with high ceilings (3.5 meters) located very close to the historic heart of Odessa. Second floor of the 3-storied historical restored building. It has huge double beds in the bedrooms, nice modern furniture in the living-room, fold out sofa could be transformed into the 3rd bed. There are a tiles on the floor in bathroom and WC. Autonomous water supply and system of heating. Apartment has all needed consumer electronics such as 3 TV sets with satellite (75 channels), iron, fridge, air conditioner, microwave, washing machine, DVD. Local calls within Odessa are free of charge. Parking is available in the yard. 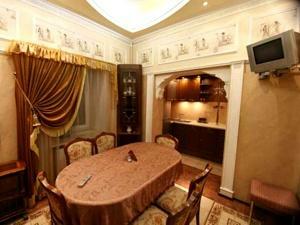 Deluxe 2-bedroom apartment on 7 Sadovaya Str., opposite the Main Post Office. 5 minutes walk to Deribasovskaya Str. Second floor of 3-storey building. Apartment has all needed consumer electronics such as 2 TV sets with Satellite (75 channels), 2 DVDs, 2 Air-conditioners, microwave, washing machine, electric kettle. Local calls within Odessa are free of charge. One bedroom – classic style and the 2nd bedroom is decoraded in Japanese style. It has a huge double bed, TV set, air conditioner, wardrobe in each bedroom, modern new furniture in the dining room. There are tiles ont the floor in bathroom and WC, autonomous water supply and system of heating. Sadovaya Str. is named because it goes by 3 city gardens. Quiet and nice street in the city centre. Odessa prime downtown location for you! Recently renovated 27 sq.m. one-room studio apartment located on the ground floor on 9 Sofievskaya Str., close to Komsomolskiy boulevard and 15 min walk to Deribasovskaya. Sofievskaya St. is nice quiet street close to Odessa downtown. It's named after the beauty Sofia – a wife of Duke de Potockyy. There is a wide fold-out sofa which could be transformed into a bed in 17sq m room. There are old style tiles on the floor in the bathroom, shower cabin, toilet. Apartment is fitted with all needed consumer electronics. The phone in the apartment is for local calls only. Maximum sleeps 2 persons. Parking is available nearby. 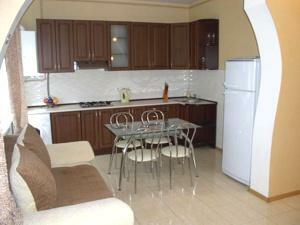 2-bedroom apartment on the main street of Odessa - Vice Admiral Zhukov lane 1. Second floor, entrance to the apartment via courtyard, front door on code, renovated corridor. Total square of this apartment is 70 sq m, ceilings are 3m. 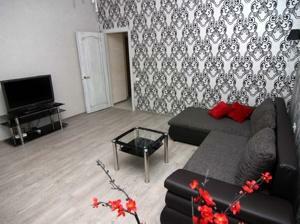 All three rooms are private – could be used as 3 bedroom apartment. There is a Queen-size bed in each bedroom, bedrooms are 12 sq m. each. First bedroom has chest of drawers, second bedroom – closet, 2 bed size tables, chest of drawers. Living room is 18 sq m with a fold out sofa, 2 armchairs, big screen TV set with cable channels, coffee table. Vice Admiral Zhukov lane view from the windows. There are tiles floor in big 10 sq m bathroom & WC. The apartment is fitted with all needed consumer electronics such as TV set with cable channels, iron and ironing board, fridge, air conditioner, hair dryer, microwave, High speed Internet Wi Fi. Apartment has a central heating system (from to October to April), good water pressure, electric boiler for hot water. Maximum sleeps 6 persons. Parking is at the nearest Athens Mall. Vice Admiral Zhukov lane 1, corner of Deribasovskaya Str. Vice Admiral Zhukov (Vitse-Admirala Zhukova) lane – please be attentive: there are 3 streets in Odessa with almost the same name – 1st Marshala Zhukova Str.,2nd Zhukovskogo Str. and 3rd Vice Admiral Zhukov lane. Even not all the drivers know the name of Vice Admiral Zhukov lane – it’s a very small, few buildings only. This lane starts from Deribasovskaya str. and ends on Bunina str. you must tell the driver that you need lane which close to Deribasovskaya. 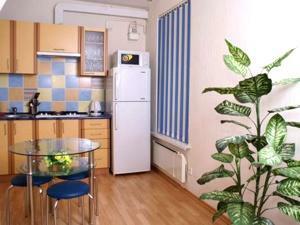 Deluxe Studio apartment (40 sq m) located on the 2nd floor at 10 Deribasovskaya Str (corner of Risheliyevskaya Str.) close to all major attractions of Odessa downtown The Famous Opera House of Odessa is just meters away! Rishelievskaya and Opera House view! Deribasovskaya is the symbol of the city, like Khreschatik in Kiev, La Lambra in Spain, CarlovBridge in Prague, via Duomo - in Milan, Piazza di Spagna in Rome. What makes Deribasovskaya the most popular place – may be it’s central location, its unique character and magnificent architecture, crowds of people leisurely sitting on terraces of numerous cafes and restaurants, perfect cobblestones, almost no vehicle traffic and big shady linden trees. 25 sq m Bedroom has a fold out sofa, King-size bed, night table, big wardrobe, chest of drawers, TV set. The apartment is fitted with consumer electronics such as TV set with cable (75 channels and video control), iron, fridge, air conditioner, electric oven, hair dryer, iron, phone. Parking is available on the street only. Maximum sleeps 4 persons. 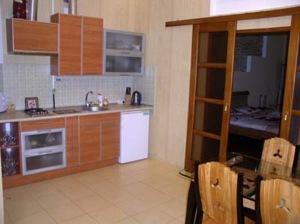 Kitchen is a separate 8 square meters room with a nice furniture, electric kettle, electric oven. 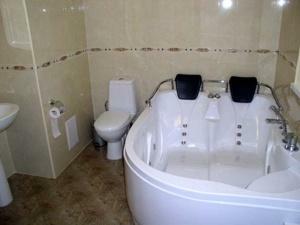 Bathroom is quite spacious, there is standard bathtub, washing basin, toilet. Apartment has central heating system, autonomous water supply. 2nd floor Business class 1-bedroom apartment in the very heart of Odessa at 14 Ekaterininskaya Str. (corner of Deribasovskaya Str.). Perfect location in Odessa, Ukraine! 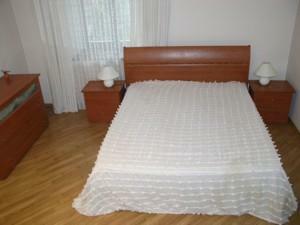 King-size bed in the big 22sq m bedroom and a modern new furniture in 42 sq m living-room. Modern air conditioner makes the air in the apartment clean, fresh and healthy what makes your stay in this apartment pleasurable and comfortable at any time of the year. Phone in the apartment is for local calls only. There are tiles on the floor in big bathroom & WC, autonomous heating system and good water supply. Apartment is fitted with all needed consumer electronics such as TV set with satellite (75 channels), iron, fridge, air conditioner, washing machine, microwave, CD. Cozy 1-bedroom apartment located in the quiet part of Odessa historical center, on 4 Nekrasova Lane within 15 minutes walk from Deribasovskaya Str. Height of ceilings is 3,5 m on the first and second level and 2,3 m on the third level. Apartment is located on the 1st floor (there is a ground floor also), and it has 3 levels. The main attraction of the apartment is a really old fireplace (artificial) and more than 100 y.o. antique wooden stairs. On 1st level there is a living room with a fold out coach, two arm-chairs, coffee table, 32’ LCD TV set with cable channels, spacious round shape balcony where you can set during the whole year and enjoy breath of a fresh air. On 2nd level there is a spacious kitchen with dinning table, all necessary furniture, bathroom with shower cabin, toilet, washing basin. From the kitchen there is an entrance to the third level where the bedroom is. 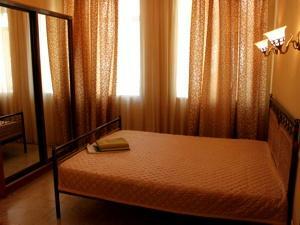 Is has Queen-size bed, wardrobe, TV set with cable channels. Apartment has autonomous heating system and good water pressure. It's equipped with all needed consumer electronics such as 32’ LCD TV set and TV set with cable channels, washing machine, air conditioner, telephone, high speed Internet Wi Fi, iron, fridge, microwave, DVD, hair dryer, telephone for local calls. Maximum sleeps 4 persons. Guarded parking is available right outside the courtyard. 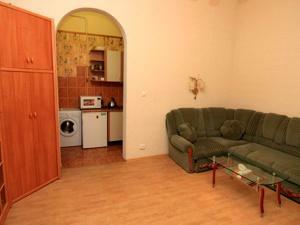 1 bedroom/studio small & cozy 2-level apartment on the central street of Odessa - 2 Ekaterininskaya Str. It's the 2nd (after Deribasovskaya) most popular street of Odessa with dozens of restaurants, cafes, shops. Perfect for those who come to Odessa to enjoy the energetic night life. Very good renovated entrance, front door on code. First floor of 3-storey building. Separate sleeping area on the second level and living area on the first level. Nice classic style furniture, all consumer electronics, High speed Internet. There are fold out sofa, little table, two armchairs, a telephone and a TV set with 75 satellite channels in a living room, kind size bed in a bedroom, small kitchenette with all helpful amenities, i.e. a coffeemaker, a fridge and a gas oven. Shower and WC are combined. 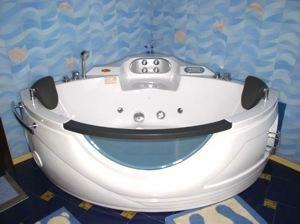 Autonomous water supply, central heating system and electric water heater will make you feel very comfortable. Night clubs, restaurants are within 2-5 minutes walk. Ekaterininskaya str. is a long street which begins on Ekaterininskaya square (close to the world-known Potemkin Stairs) and ends on the famous Odessa PRIVOZ. But it takes no more than 30 minutes to walk from its beginning to the end - Odessa downtown is not very big. Recently renovated one-room cozy studio (30 sq m) with high ceilings of 2,7 m. Located on the second floor on 18 Polskaya Str., 5 min walk to Deribasovskaya Street. Entrance to the apartment via big courtyard, front door is on code. There is very nice and sunny 17 sq m room with the living area which consist of 2 fold-out armchairs, sleeping area with a king size bed and a small kitchenette. Tiled bathroom with a shower cabin, toilet and washing basin. There is central heating system and a good water pressure. Apartment is fitted with consumer electronics such as TV set with cable channels, DVD, CD, iron, fridge, air conditioner, microwave, phone. Parking is available on the street or in the courtyard. Maximum sleeps 4 persons. Mini hotel at 24 Grecheskaya Str. (corner of Rishelievskaya Str.) just 3 min walk to the famous Deribasovskaya Str. 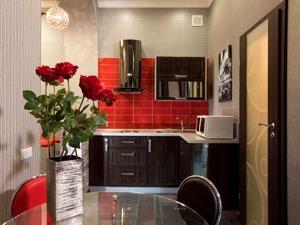 6 1-st class apartments are offered for guests of Odessa. Two-room / 1-bedroom cozy apartment in the very heart of Odessa, second floor. It has king size bed in the 12sq m bedroom, modern leather furniture sofa and 2 arm-chairs in 28 sq m living-room, small kitchenette. There are tiles floor in shower & WC, autonomous heating system and water supply. Business class non-smoking 2-bedroom Odessa apartment located on the 2nd floor between City Garden and Mayakovskyy lane at 24 Preobrazhenskaya Str. just few minutes walk from Deribasovskaya Str. Quiet yard within 2 minutes walk to the main street. Preobrazhenskaya Str. is a very long street that divides Odessa center into 2 parts. The beginning of the street – is on Komsomolskyy boulevard, the end – near the famous market PRIVOZ. Book one of them for your friends and stay at the same building! Entrance to the apartment via locked yard. It has a king size bed and a closet in each bedroom, living area with a fold out sofa, very soft and comfortable armchair. Modern tiles in bathroom & WC, autonomous heating system and good water pressure. Apartment is fitted with all needed consumer electronics such big screen TV set with Satellite TV, CD player, washing machine, air conditioner, microwave, home theater, iron and ironing board, hairdryer, safe, telephone, High speed Internet Wi Fi. Parking is available in the courtyard. Amazing place to stay in Odessa!